Rachel Barry demonstrates how the sandhand goes from flimsy to moldable. The goal of this demonstration is to show how very common materials can do very unusual things. Set out sand hand with pump. Before turning on the vacuum pump, allow a few members of the audience to play briefly with the glove, making sure they see that when a finger is held up and then let go, it drops down again, and so forth. Ask the visitors if they can guess what's inside the glove. Then turn on the vacuum pump. Open the valve. The glove will become hard, and can now be deformed. 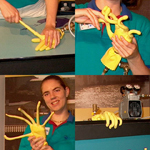 The fingers will be easier to deform than the hand, so let visitors play around with the fingers, stretch them out, scrunch them down, stretch them up, etc. After the glove has been evacuated, hold it out and have them shake hands with it. Let them touch the glove to feel how hard it becomes. Ask the visitors if they can guess what's inside the glove now. Some favorite shapes: a clenched fist, fingers stretched up as far as possible, gripping the edge of the table, fingers scrunched back into the hand (so that they grow when the valve is opened). Also, another neat trick is, in the beginning after they have had a chance to see it and before the pump is turned on, to roll the fingers up into a clenched fist and hold it with one hand. Ask the audience what they think will happen to the fingers when they are let go. Turn the pump on, open the valve, and let go of the fingers. They will stay in place. After the glove is set in a crazy formation, close the valve, turn off the pump, then slowly open the valve and watch the glove return to its more lethargic state. Make sure sand hand is deflated and close valve. Carefully return the whole contraption to storage. While most of the time sand can only be loosely shaped and behaves somewhat like a liquid (in that it is also shaped by its container), grains of sand are actually tiny cubes, so that under pressure sand behaves more like the solid that it is. By evacuating the glove of air, the grains of sand are forced together tightly, and the glove can then be shaped. Credit for this demonstration idea goes to Maarten Rutgers. If the seal around the filter is not very good, the air will leak out whenever the pump is off and/or the valve is closed. Use liquid silicone and tape. A perfect seal is virtually impossible, but the seal has to be at least good enough so that the air leaks in slowly. If the filter is too strong or too weak, you could have a pump full of sand or a perpetually limp glove. Use a small piece of cloth covered by a small piece of paper towel as a filter for best results. Also, keep a close watch on the glove for signs of wear. Use a new glove at the first signs of tearing. The glove will get stretched out after ten or fifteen runs, and the change in size of the fingers will be less dramatic, so replace as necessary. When shaping the hand, make sure the fingers will fall more or less straight back down on the table when the pump is turned off, otherwise they will rest on one of the other fingers, which is less impressive. To replace the glove, fill a glove with sand to about one inch past where the inside of the thumb meets the hand. Place the glove on the end of the filter, and secure it with a hose clamp.